Posted on Tuesday, November 15th, 2016. 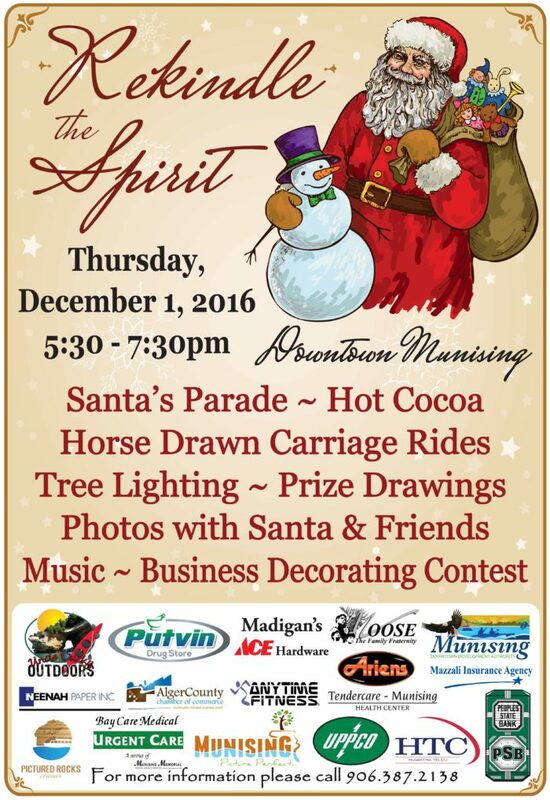 This year’s Rekindle the Spirit will be Thursday, Dec. 1 from 5:30-7:30. Not only will there will photo opportunities with Santa (PSB) and the Grinch (the Moose Lodge), but a polar bear character will be at HTC and Rudolph at Falling Rock with various other characters downtown. Others will be a Frosty the Snowman, elves, and a gingerbread man. This year we will also be offering Christmas carriage rides. Hope to see you there and spread the word! Posted on Friday, September 30th, 2016. 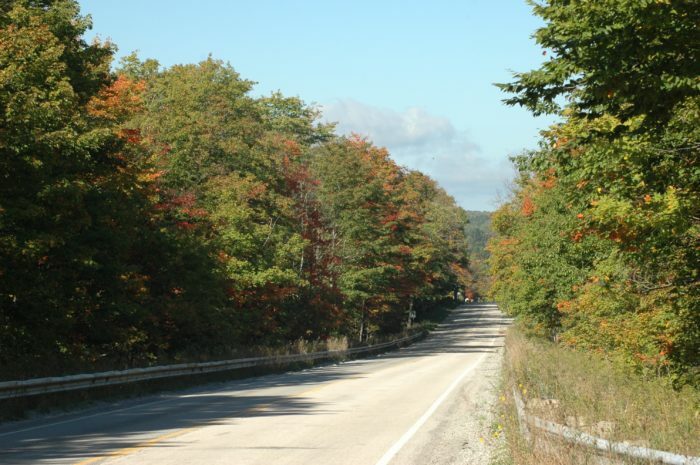 Sept. 30, 2016 – Looking east on M94 heading towards Munising. Sept. 30, 2016 – Looking north on Highway 13 just south of Wetmore. Posted on Friday, September 2nd, 2016. Our free September calendar for your computer screen background is now available to download. 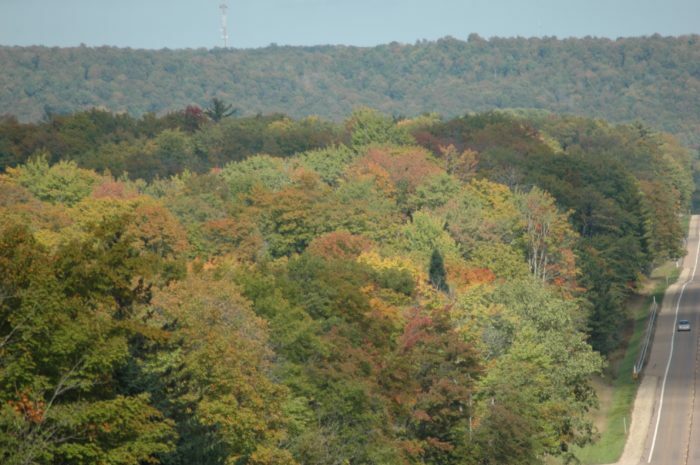 It features a beautiful early autumn scene in rural Alger County (Sept. 2013). Photo by Tim Trombley – www.greatlakesphotography.net. Posted on Tuesday, July 12th, 2016. 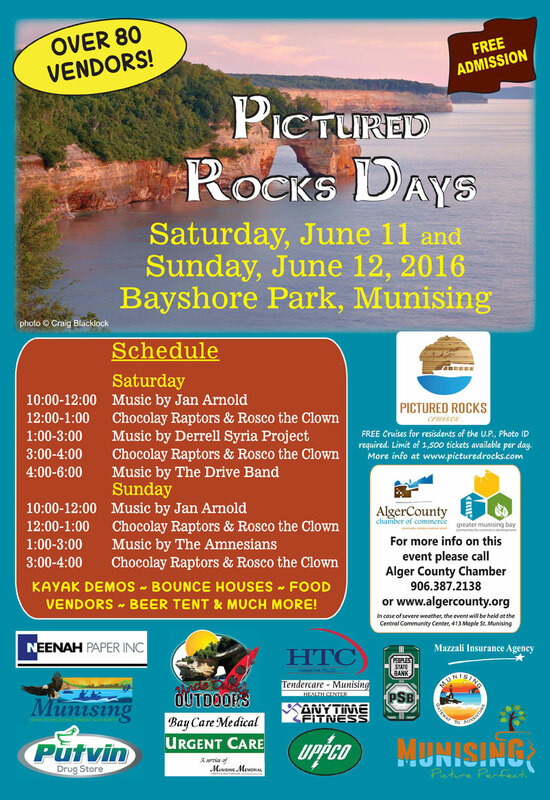 Munising, Michigan – In honor of Lake Superior Day, Pictured Rocks National Lakeshore interpreter Andrea Chynoweth will lead a beach walk at Miners Beach on Sunday, July 17 at 10 a.m. The hour-long walk will focus on the power of Lake Superior to influence both aquatic and terrestrial ecosystems, impacts on weather, and the dynamic forces at work where water meets land. Meet at the parking lot at the west end of Miners Beach, six miles north of H-58 on Miners Castle Road (H-11) in Pictured Rocks National Lakeshore. Lake Superior Day is an annual event that occurs the third Sunday of July. 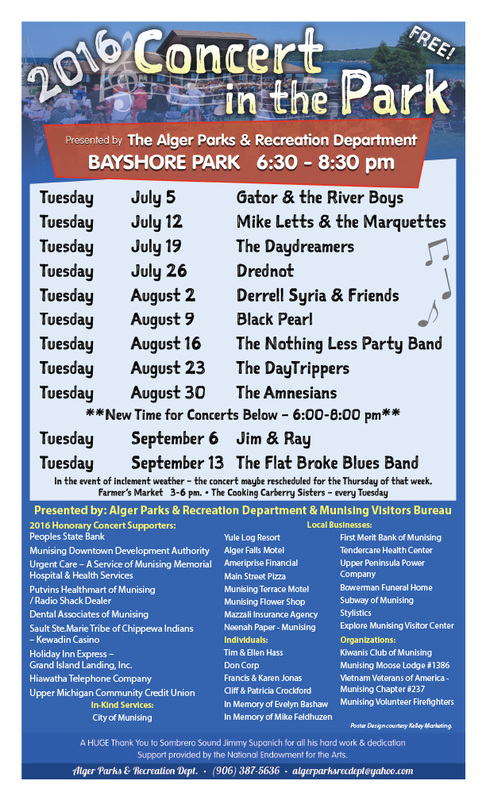 Started by a group of citizens in Thunder Bay, Ontario in the 1990s, it now includes celebrations and activities from more than 50 groups and communities around Lake Superior. Posted on Wednesday, June 8th, 2016. Posted on Thursday, June 2nd, 2016. Our free June calendar for your computer screen background is now available to download. It features a beautiful summer scene of Grand Sable Dunes and Grand Sable Lake. 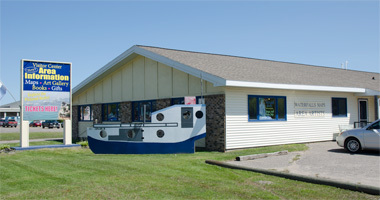 Photo by Tim Trombley – www.greatlakesphotography.net. Posted on Saturday, May 21st, 2016. Gladstone, MI – As we move into the weekend, fire danger remains very high throughout the Upper Peninsula, and is extreme in some locations. Fire officials at the U.S. Forest Service urge residents and visitors to be cautious with the use of fire while enjoying the outdoors in Michigan’s Upper Peninsula. Dry conditions, warm temperatures, low relative humidity, strong winds, and potential for lightning storms are contributing to the very high fire danger levels in the Upper Peninsula of Michigan. Fire officials offer the following tips to go by while enjoying the area’s many outdoor recreation areas. When traveling, only pull over into developed areas such as rest stops, to prevent heat from catalytic converters or exhaust emissions from sparking fires in roadside grass. Before leaving, ensure tires and brakes are in good shape as well. Never throw burning matches or materials out a vehicle window. Before starting campfires, verify that fires are allowed at that location. Be aware of any current restrictions that may limit or ban the use of fire in your area. Campfires should only be started in designated locations and must be contained within the fire rings provided. Only burn firewood that fits entirely within the fire ring. Keep water nearby. Keep debris and extra firewood away from campfires or outdoor BBQ grills. Never walk away from a burning or smoldering campfire. Use water and dirt to completely extinguish the fire. The ground/coals should be cold to the touch before it is safe to leave. Remember that fireworks are NEVER allowed on public lands. For more information, contact a local National Forest office or your local fire management agency. Our free February calendar for your computer screen background is now available to download. It features a beautiful winter scene along the AuTrain River at Lower Falls. Photo by Greg Kretovic – www.michigannaturephotos.com.